Dr Aldo Bocciardi studied medicine at the University of Pavia and completed his specialisation in urology at the University of Milan in 1987. Following a significant experience in paediatric urology in France, he worked as a consultant for the urology department of the San Raffaele hospital in Milan. 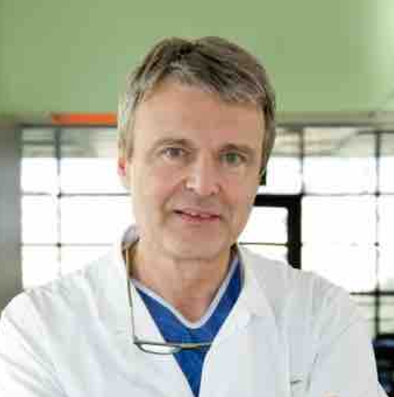 Since 2007, he manages the urology department of the general hospital Niguarda in Milan. His interests include oncological surgery and robotics. He developed a technique for a posterior surgical approach to robot-assisted radical prostatectomy which allows for a quicker return of urinary continence. Dr Bocciardi’s experience in oncological and robot-assisted surgeries allows him to regularly attend as an expert national and international conferences. He is the author of over 100 publications. He is an active member of various scientific associations (American Urologic Association, European Association of Urology, Italian Society of Urology, Italian Society of Pediatric Urology). Dr Bocciardi is often invited to perform live surgeries to demonstrate his technique of the posterior approach to the prose with the preservation of periprostatic anatomy (« Retzius sparing »). He is a consultant at the SIPC and has obtained the recognition of his diplomas in order to operate at the Clinique Générale Beaulieu.